Attracting millennials is a goal for most wineries. At Starview Vineyards on the Shawnee Hills Wine Trail, appealing to younger customers comes naturally. Winery co-owners Brett Morrison, 30, and Regina Morrison 29, are not only members of the most over analyzed generation, they also project a youthful enthusiasm that fills the tasting room. “We love the industry, it’s our lives,” Regina says during an early Sunday morning interview. Her long, black hair is still wet from the shower and one gets the impression she pretty much lives at the winery. Starview is open seven days a week and Regina is behind the counter at the tasting room every day. Regina’s husband, Brett, is the winemaker and vineyard manager. They met while working at wineries in their native Pennsylvania. 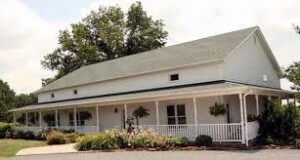 While searching for a location for their own winery, they fell in love with the rolling hills of far Southern Illinois. So two years ago, they bought Starview. The asking price was $1.5 million. The couple had to take on debt to buy the winery, but they don’t seem the least bit nervous. Brett thinks Norton is a wine that gets better with time. “Our Norton could age as long as ten years,” Brett says. Starview’s 2008 Norton proves his thesis; the tannins on this wine are much softer than a younger Norton. 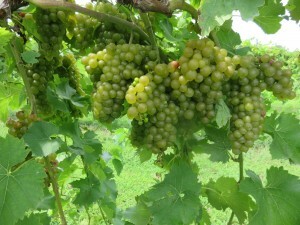 Currently, all Starview’s wines except Vidal Blanc are estate grown. Last year, the winery planted a block of Vidal on their eight acre vineyard, so soon all Starview’s grapes will be home-grown. In order to have an estate grown, old world wine on the tasting list, Starview planted Merlot this year. Starview will be the first commercial winery in Illinois to have a Merlot, according to Brett. 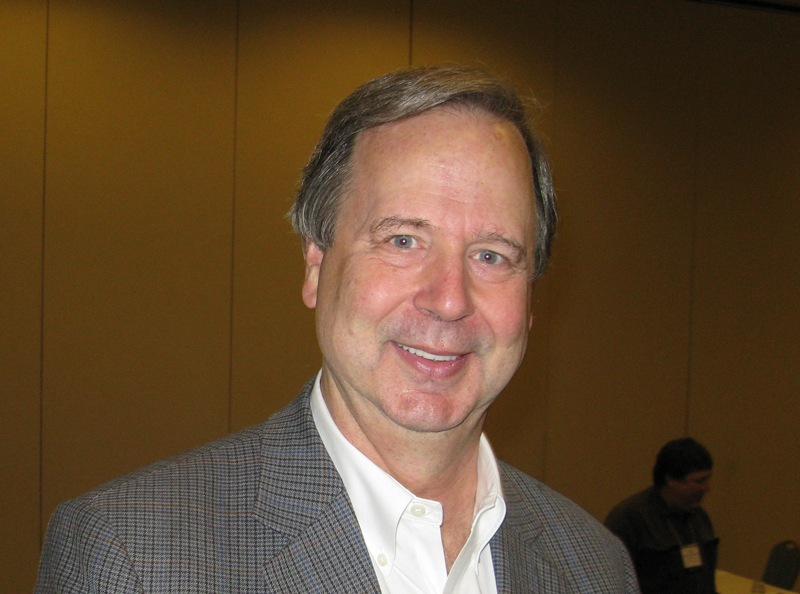 He found his Merlot rootstock at a Pennsylvania nursery near their native home. Brett says the Merlot clone is cold tolerant and should be able to handle Southern Illinois winters. When their vineyard is completely planted, the Morrison’s plan to have 25 acres of grapes. Considering Southern Illinois vineyards usually produce in excess of three tons of grapes per acre, that’s over 75 tons of grapes per year. One person harvesting all those grapes alone in the hot sun would burn at least 150,000 calories. Brett agrees that some mechanical harvesting will be necessary as Southern Illinois wineries get larger. 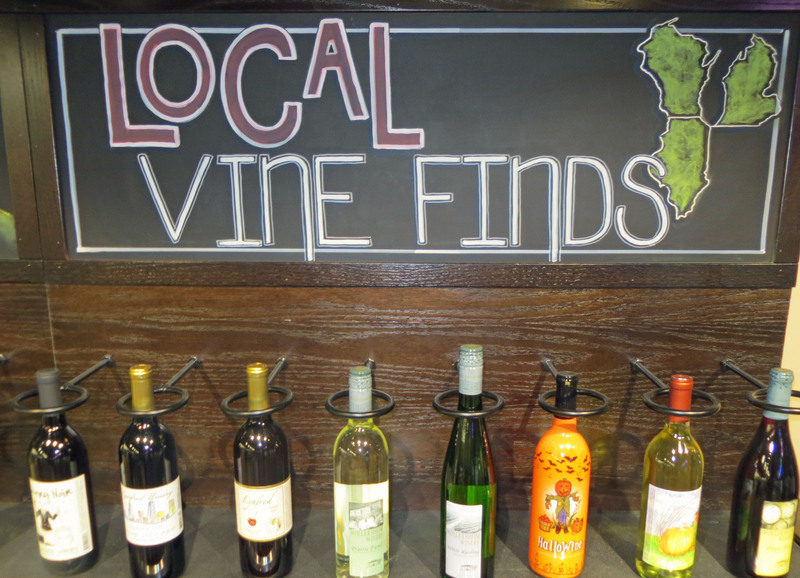 But for now, you can get hand-picked, hand-made wines at Starview and other area wineries for a very reasonable price. It’s apparent that a lot of work also goes into the tasting room at Starview. All facilities are clean and well-kept. On a normal summer Saturday, Starview gets about 500 visitors. The winery draws both young and old, but there’s definitely a young person’s vibe. College students have always been a delicate issue at Southern Illinois wineries. Most are well-behaved, but some students have not yet figured out the difference between a bar and a winery. Fortunately, Starview is the farthest winery from Southern Illinois University on the Shawnee Hills Wine Trail. The winery usually has live music on weekends, which is a big draw. “Sunday is the better day to visit if you want to become educated about wine,” Regina says. One wine to learn about at Starview is the Vignoles. This hybrid wine is much like semi dry Riesling with peach and pear flavors. At $16 per bottle, Starview Vignoles is a great value. Starview does not harvest Vignoles until September. Letting a delicate grape cultivar, like Vignoles, stay on the vine in the fall is a risk some winegrowers won’t take. Brett explains that letting the fruit hang longer allows the acidity in the wine to decline. Less acidity means less sugar is needed to produce a balanced product. Starview Vignoles has only about 2% residual sugar. Overall, Starview produces European style wines with long finishes and good balance. Brett says that he does not like wines with excess peaks and valleys. Brett’s winemaking preferences are exemplified by Red Star, a semi-sweet Chambourcin. This jammy Chambourcin has a long 13 day maceration with a pump over two times per day. There’s good fruit at the start- mainly raspberry- then mocha flavors dominate. Brett says this style of Chambourcin was a hit in Pennsylvania. Judging by the wine I sampled, it should be popular in the Midwest too. 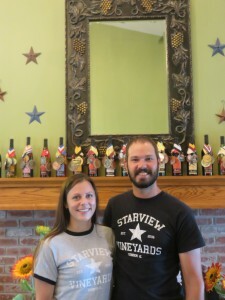 The Shawnee Hills Wine Trial keeps getting better and Starview is an example of a dynamic winery that changes with the times. The energy the Morrison’s exude is contagious and I left the winery feeling decades younger. Red Star semi sweet Chamb, they made in Penn where it was a huge hit.